Lazyblog@Lazykate: Bowland Wool - Yum!! The last few weeks have consisted of a lovely weekly hospital stay where the daily treatment consisted of free Jeremy Kyle (why, NHS why? 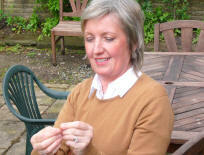 ), a spinning workshop at Knit-Wise in Ormskirk and a very interesting visit to Bowland Wool. Our first Knit-Wise workshop was great fun, the ladies went home at the end of a loud day (laughing, not swearing) with a lovely skein of wool which Rennie said she would frame. We should all frame our first skein, don't you think? And I would have done if my dog hadn't ragged it all over the place. Although as it was my very first skein, it didn't look much different after she had finished than it did before! The weather has started to pick up now, although it's still cold, and we made a start on the field! It's a small miracle but we got our little plough out, which I think could have previously been owned by Noah himself and with the help of the weight of a small child we managed to plough over the field. And then we found that if the small child drove the mower, the weight of a large man would make all the difference. So our first beds are in, separated by laminate flooring boards and a bamboo wigwam. We're ready to go. Only another eight or so beds to put in and we may have the start of a kitchen and dye plant garden. Last week's highlight was a visit to Bowland Wool in the forest of Bowland in Lancashire which is the most beautiful area to visit. The land is owned by the Queen don't you know. She allowed us access as long as we put our best accents on and promised not to touch. Bowland Wool is run by Rosemary Johnson, who is championing the wool from Bowland Farmers. The wool is Bluefaced Leicester, which is a favourite of mine because of the staple, which makes it easy to spin and it is also less irritating to the skin, so people who don't normally like wool on their skin can ofter tolerate BFL. 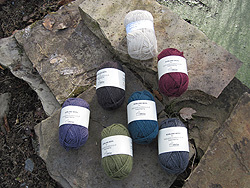 The palette she has chosen is lovely, muted, classic shades that will knit up beautfully. She is passionate about keeping all the textile crafts alive and so there are workshops on quilting, knitting, dressmaking, and now spinning, as I will be running a workshop on the 9th of April! There is also lots going on over the Easter holidays and I will post more nearer the time. It would be lovely to meet any of you. I would really recommend a visit to the area if you're looking for somewhere interesting or inspiring for a day out.. The countryside is just so beautiful, the forest of Bowland is famous for it's food. Of course there is the Inn at Whitewell to visit for a meal, and then to Rosemary at Bowland Wool for your fix of all things textile. Go on, you know you want to!